Having good posture is vital to your good health. Posture plays an important part in preventing or managing back pain or neck pain during any activity. Bad posture while sitting in an office chair, driving, or standing for long periods of time may lead to back pain. 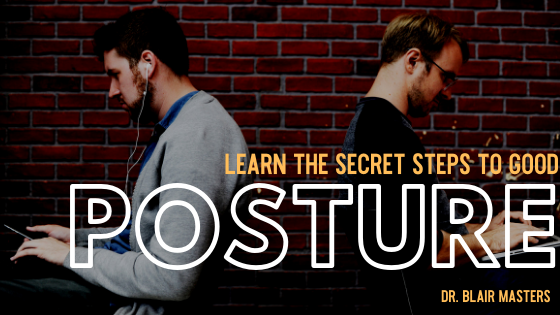 If the posture is bad enough it may be the primary cause of your pain.When standing it is important to maintain the natural curve of the spine in order to achieve good posture. The spine is similar to the letter S when viewed from the side and maintaining the curves is what is key to proper posture. Think of it as if someone attached a fishhook to the middle of your chest and is pulling directly skyward. When you first attempt this posture if you are not already doing it, you may feel a bit awkward. It may feel very difficult to maintain, especially over long periods. Give it some time and it will begin to feel natural. Keeping a good posture can sometimes be tiring, particularly at the beginning and this can be due to weak spinal muscles. Another cause of pain is prolonged standing on a concrete or hard floor. If you must do this, it is best to wear shoes with cushioning and good support. Often a rubber mat or cushioned mat can help. Using a mat and wearing the proper shoes are important steps to ease pressure on the back. While many of us are increasingly spending large portions of our day in front of a desk it is important to have the correct sitting posture. Bad sitting posture can result in back pain and neck pain as well. Most of this pain is avoidable and the first step is to make some simple adjustments. Adjust your chair to modify your sitting position from a forward leaning slump. The best position is to sit back in the chair and to use the chairs lumbar support to keep the head and neck erect. Your work surface should be approximately elbow high. One finger should be able to slip under the bottom of the front of your thigh. If this is not possible then a footrest might correct this. The back of your chair should push your lower back forward slightly to offer lumbar support. Adjust how high your computer screen is as well. This can be a major factor in regards to proper posture. The center of your computer screen should be slightly above horizontal to your eyes. Use books or a milk crate or something of the sort to raise your screen up if needed. Get a desk that can be converted from sitting to standing. This can put the stress of work on a completely different part of your body. Remember to periodically take stretching and walking breaks when sitting for long periods of time. This is an important subject, as you will spend a large part of your life at work. It is worth the effort it takes to get it right.